F Company, 331st Infantry Regiment "Envelope"
This is an original censored WWII Army Cover dated May 29, 1945 and is franked with stamp #UC8 "Air Mail". The envelop was sent by Pfc. 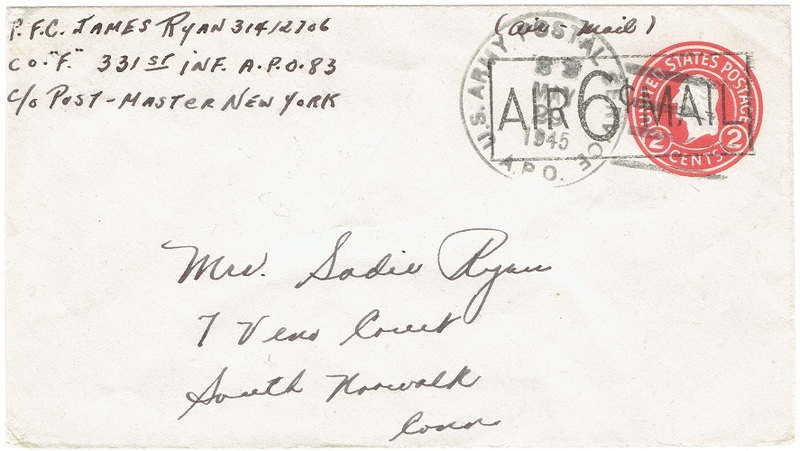 James Ryan to his wife Sadie Ryan in South Noewalk, Connecticut. Nevertheless the envelope contains nothing. The address the envelope was sent from was APO #83 which was in Wernigerode, Germany on this date. Find more info on James P. Ryan on the page "THE MEN OF THE 83rd"